Imaicho is a compact, beautifully preserved Edo period merchant town. Strolling its narrow streets is like wandering through an open museum of living history. It makes for the perfect outing and can be combined with visits to other attractions in the wider Kashihara area. Kashihara Jingu Shrine is a must-see, and easily reached by rent-a-cycle. The well-preserved district is filled with the kind of houses and shops you would expect to see in a Japanese period drama. One such shop is Kawai Sake Brewery, a family-run brewery. Although you can’t tour the factory itself, they offer free tastings in the historic building which was also the family home. Some houses such as Imai Machiya Museum, restored to its original appearance after years of neglect, are free to explore and have volunteer guides on hand. For maps and local information, Imai Machinami Exchange Center Hanairaka is a great place to start. Cafes and restaurants in the area tend to serve Japanese fare. For something more familiar, Tama, a modern locavore French eatery is an excellent choice. The food is sophisticated and elegantly presented. Housed in a converted machiya townhouse, the venue is light and airy during the day with a more romantic vibe at night. Not far from Imaicho town, Kashihara Jingu Shrine is said to be the site of the palace of Japan’s first Emperor, Jimmu, in 660 BC. Look out for the three legged crow symbols and amulets here; the mythical Yatagarasu is said to have led Jimmu safely through the mountains to this area. Miwa is known as the birthplace of sake and brewers from all over Japan visit Ohmiwa Jinja Shrine to pray for good batches. Buddhist monks pioneered the technology, producing sake for religious ceremonies; some also went up for sale. Shoryakuji Temple is famous for sake production, in particular the refined sake known as Nara-shu. There are breweries throughout Nara, with many offering tours and tastings. 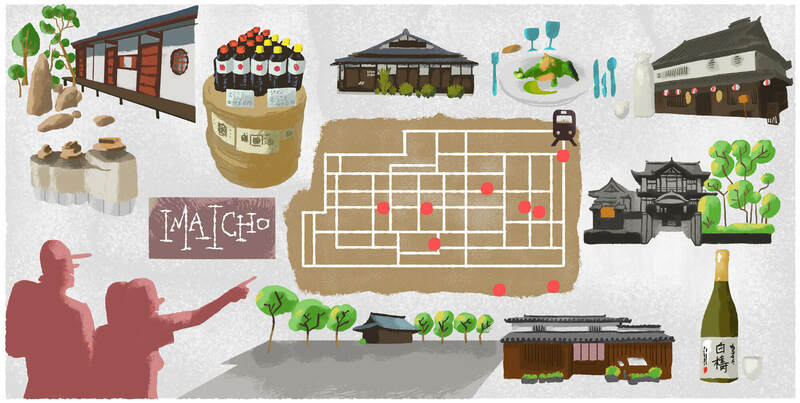 Find out where to sample the region's sake. Soba noodles owe their subtle flavour to the buckwheat grain from which they are produced. Known as towari, those made from 100% buckwheat are particularly coveted. In summer, chilled soba with dipping sauce is popular; in winter, hot noodle soup warms the bones. At better establishments, soba is hand cut to the right thickness and prepared al-dente like pasta. Japanese cuisine would certainly not be what it is today without shoyu, known in the West as soy sauce. Picturesque Imaicho is home to Tsuneoka Soy Sauce Brewery, a shoyu distillery which opens its doors to visitors. Here you can see this 7th century Chinese import’s transformation from humble soy bean into the condiment that has been integral to Japanese cuisine for centuries. Picturesque Imaicho is a pleasant area to stroll throughout the year. The view at dusk makes for a particularly romantic setting. Early mornings and weekdays also allow visitors a more intimate experience and are ideal times to take in the architecture with little interruption. For exploring the area's quirky cafes and shops, weekends are best, when more is open. Imaicho is easily navigated on foot, but to explore the wider Kashihara area consider renting a bicycle. Rental outlets can be found at certain train stations and tourist information centres. Kashiharajingu-mae Station has two rental shops nearby, making it a good starting point to begin a trip in the area. Shops and restaurants in the Imaicho area sometimes close on weekdays. If visiting during the week, you may want to try the area around Yamato-Yagi Station for more food and drink options. Imaicho is an easy half-day excursion from Nara, and can be combined with a visit to Kashihara Jingu Shrine to make for a full day out. The best course is to visit the shrine in the morning, when it's at its most atmospheric. After that, head to Imaicho at around 11:00, once shops and restaurants begin to open. A small historic area in Kashihara City, Imaicho is not served by its own station. Instead, it can be reached on foot from one of several nearby stations. Take the JR Line and get off at Unebi Station for the quickest route.